The striking autostereoscopic screen of the Nintendo 3DS might be responsible for the console gaining countless column inches over the past year or so, but here at Nintendo Life we've been equally as impressed with the potential offered up by the external cameras. Augmented Reality isn't anything new - it's been big news in iPhone gaming circles for a while now - but the way in which Nintendo has appropriated the concept for the 3DS leads us to believe it could be the next big thing in portable gaming. The 3DS comes pre-installed with two Augmented Reality applications: Face Raiders and AR Games. The former is a 3D shooter which allows you to paste your face onto an army of floating monsters. You then use the 3DS to target these ugly beasts and shoot them down. The game calls on you to move your entire viewpoint around the room, and as the challenge progresses you'll see enemies smashing through the scenery, which creates an awesome 3D effect. Face Raiders is undeniably great fun, but AR Games arguably takes things to the next level. 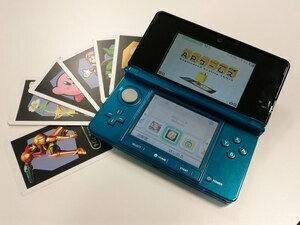 It utilizes a deck of cards which come packed with the console. Aiming the camera at the card on a desk causes 3D characters and objects to appear, and it's possible to move around these items to view them from different angles. Several short-burst mini-games are included. The first is a shooting range, where you fire arrows at targets dotted around your desk. This mode culminates in a boss battle with a furious dragon, who not only lunges towards the screen to bite you but also flings fireballs in your direction. To avoid these attacks you simply duck out of the way - an obvious mechanic, but one that feels refreshingly new. Another game revolves around using a pool cue to knock a ball onto a target. Here, your desk is warped and distorted to create a fiendish crazy golf course, complete with moving platforms and lava traps. Again, this mode ends when you face off against a revived dragon, only this time you have to use the cue to bash a deadly projectile into his scaly hide. The fishing mode offers a more sedate challenge, with your desk being transformed into a floating ocean. The objective is to bag the largest fish possible, but that pesky dragon is once again on hand to cause trouble. In addition to these mini-games, there's also a drawing application which allows you to draw and write on the 3DS touch screen. What you create appears in 3D on the console's main display, and you can move around said creation. Variations on these games can be unlocked at a later date, too. While none of these modes can be described as anything more than glorified tech demos, they offer an exciting glimpse into the future of the 3DS platform. When combined with the console's autostereoscopic screen, the impression of realism is heightened even further. Although AR Games is very similar to the concept behind Sony's PS3-based Eye of Judgement game, there is currently nothing like this on any other handheld console. Expect massive things in the near future. While I don't think it quite compares with this, there is Invisimals on the psp. I'd say thats a similar offering on a portable. Oh! Anybody know if they will be selling more AR cards via retail outlets. I wonder if there going to make more Cards? "The former is a 3D shooter which allows you to paste your face onto an army of floating monsters. You then use the 3DS to target these ugly beasts and shoot them down." Wait when does this come out again? Lost count. This sounds really fun! I can't wait to shoot some of my friend's ugly mugs (hehe) and take on this weird dragon thing! The drawing AR game seems pretty interesting. this looks great, too bad the camera was pointed at the bottom screen half the time. the fishing and the writing one look awesome! Sweet! March 27 cannot come soon enough! March 27 cant cant wait! Trying to get my to come in next day ship from amazon, just cant wait for 4 days after that. I really had no intentions of even trying these out, but I'm now looking forward to them! How could you not have had any intentions?! It's unfathomable to me. You guys need to help me decide whether to get this. I live in the USA and moving to Europe. This means I will have to import games. I cannot see 3D. The 3-5 hour battery life bothers me. Wanna hold it in my hands so badly!! Awesome! This could be potentialy awesome for games like marioparty. I wouldn't want to play a whole game this way, but mini-game collections could use this really well. I think it could also be used as really fun multiplayer. Just tape the card to your foreheads as you and a friend walk around the room with your 3DS' shooting at each other's card target thingy. It could be used in full in an eshop game too. I just don't think it would be good for a full length game. Who think's real world 3DS multiplyer shooters would make for awesome downloadable eshop games!?!?!? These are one of the things on the 3DS I've looked forward to the most. i'd love to see if Nintendo could release more card packs, or more games on the eShop. Sorry, but I'm not running around with a card taped to my head, giggling as I run all over the room holding my 3DS in front of me. Besides looking like a total idiot, this would be a great way to smash into someone or something and get my 3DS broken. 3 words: Yu. Gi. Oh. Not super interested in any of these games in and of themselves. I am excited to see what devs do to flesh these ideas out into real games. psp2 can do this 2. (copycats) and if nintendo can blend some full games like this or add more ar games thru eshop that will be great! let go nintendo, lets go! Very cool, it's so cool that even NGP is doing it! @17.Mikau94 Just wait until you move to Europe before you purchase anything if you don't want to import. And I'm sure 3DS games will be as enjoyable as anything else in 2D. Can't those companies come up with their own innovative ideas instead of stealing Nintendo's?! The character cards are just 3D statues huh? Neat I guess. I'm still amazed by this technology. I like that we have something to do even if we get no games when we purchase the system.